In 2017, 179 new altcoins were launched, many of which have since decreased in value dramatically. With BITRUST, investors who are interested in coins thatare new to the market will be able to hedge the risks associated with such pitfalls. We offer a secure and easy-to-use risk management solution for cryptocurrency enthusiasts which enables cryptocurrency investors and day-to-day users to significantly mitigate risks associated with high market volatility. The huge increase in the number of wallets suggests that more and more investors are coming into the market, thus increasing the liquidity and attractiveness of cryptocurrency investments. At the same time, only a limited number of risk mitigation solutions have been introduced for these investors. As part of our overall contribution to the astonishing growth in this area we hope to further increase the ease of the cryptocurrency market by granting users access to the BITRUST platform. We believe that it will lower barriers to entry for new investors, scale up the amounts invested by current cryptocurrency market participants, and increase the liquidity of altcoins. i. e. to drop or raise against another cryptocurrency. It is an affordable, decentralized, easy to use, peer-to-peer cryptocurrency marketplace with a transparent self-execution based on Ethereum blockchain-leveraging smart-contract technology. Let’s see in more detail how it works. Our team’s goal is to provide the blockchain community with a simple and easyto-use risk management solution. The platform will provide an opportunity to protect cryptocurrency and significantly mitigate risks associated with high volatility in the digital currency market. 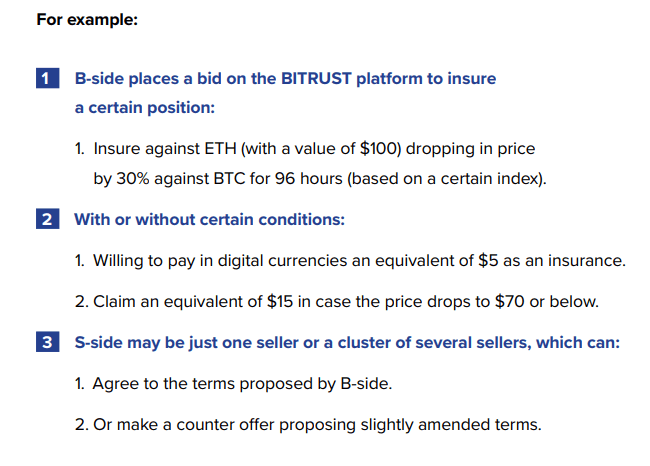 The objective of BITRUST is to build an insurance platform which will serve retail cryptocurrency investors with an average monthly trading volume of between USD100 and USD100,000. In 2017, 179 new coins were launched, many of which have since decreased in value dramatically. With BITRUST, investors who are interested in coins that are new to the market will be able to hedge risks associated with such pitfalls. (B-side), and those willing to insure are called Sellers (S-side). 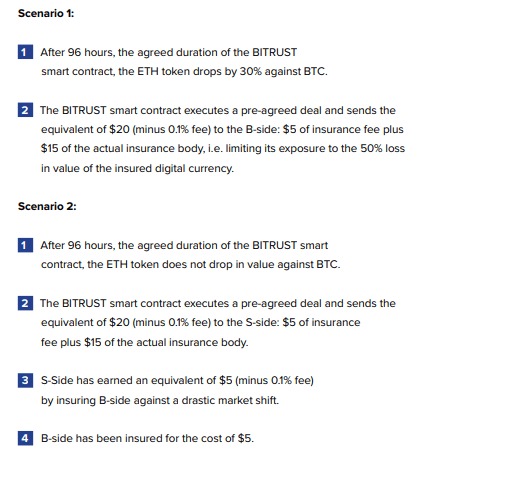 BITRUST utilizes Ethereum smart contract technology, which guarantees the execution of a transaction that has been pre-agreed by both parties. Listing BTF token on Exchanges.Our target is to list on HitBTC and Bittrex first and continue working towards listing on top exchanges such as YoBit, Liqu, LiteBit and others. Recruitment of BITRUST team.To rent a bigger office space and recruit a team of top notch blockchain developers, web developers, test engineers as well as operations and support staff. Minimum Viable Product.Develop a minimum viable product to demonstrate interface and some features of BITRUST platform, collect feedback from cryptocurrency community for further improvement. 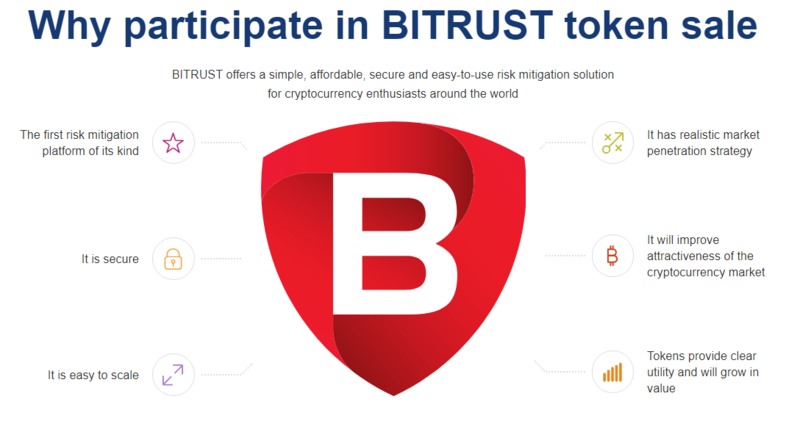 Beta Version of BITRUST platform. Develop a fully-functional early version of the platform that contains most of the major features of BITRUST platform. Growing BITRUST support team. We will establish a separate support office in London and begin growing our team of marketing & business development. Fully operational BITRUST platform launch. Develop a fully functioning BITRUST platform. BITRUST hedge funds partnership and business development. We will form strategic partnerships with hedge funds in order to further promote BITRUST platform.